3 Bedroom Detached House For Sale in Penzance for Guide Price £395,000. This impressive former barn has been beautifully converted to the highest standard by the current vendors, the decor is both stylish and contemporary yet retains an abundance of original character. 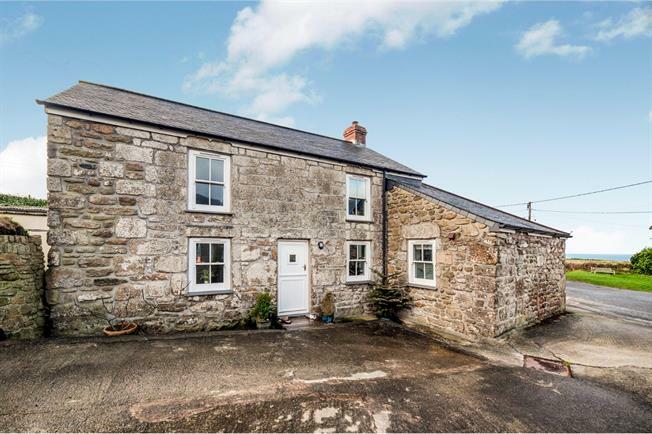 The accommodation comprises in brief; spacious lounge, second reception room, large kitchen/breakfast room with sea and countryside views, double bedroom (with en suite) on the ground floor. Stairs rise from the lounge area to the first floor which hosts two further double bedroom and spacious family bathroom. Outside is a fully enclosed rear garden and off road parking. There are stunning sea and countryside views from most aspects of this property. Double glazed sash windows to front and side aspect, under floor zoned heating and Clearview dual fuel burner. Door to kitchen/breakfast room, entrance to dining/second reception room and stairs rising to first floor. Double glazed wooden sash windows to front and side aspect (one with window seat) stable door leading to enclosed rear garden and patio. Storage cupboard housing water cylinder and under floor heating control unit. This room could easily be used to create versatile living accommodation. Double glazed wooden sash windows to front and rear aspect and hosting sea and countryside views. Door to rear, slate flooring, character exposed ceiling beams, range of modern shaker style base and wall units with solid wood work top. Spacious breakfast bar. Belling five ring gas hob (LPG) with double electric oven and extractor fan over. Plumbing for washing machine and slim line dishwasher. Double glazed sash window to front aspect hosting sea and countryside views. Access to loft space. Door to en suite shower room. Shower cubicle with electric shower, wash hand basin and W.C. Double glazed sash windows to front and rear aspect. Exposed ceiling beams, fitted wardrobe with hanging rail and shelving. Obscure double glazed window, exposed ceiling beams, W.C, vanity unit with wash hand basin, heated towel rail, bath with mixer taps and mains waterfall shower over. Double glazed sash windows to front. Exposed ceiling beams, fitted wardrobe with hanging rail, draws and shelving. The front of the property is concrete and provides off road parking fro two vehicles, to the rear is a fully enclosed garden mostly laid to lawn with paved patio area.